I had to share with you the best story that I have heard all week. Have you ever sent a message in a bottle? Or had the inspiration to? Many of us who have lived or vacationed near the ocean, have tried this as kids and dreamed of it working, but most of us don’t really expect it to. Well, for two young women from Montreal, who sent a message in a bottle floating in the Atlantic Ocean, this dream came true. While on vacation in the Gaspé region, two twelve-year-old girls inspired by the idea from a TV show, decided to send a message in a bottle in hopes that whoever came across it would contact them with the find. 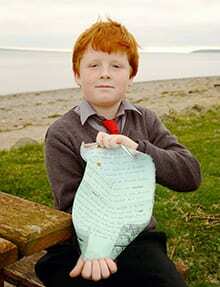 Eight years later, a nine-year-old boy, Oisin Millea of Ireland, found their bottle. This was a lucky happenstance for both parties – the girls who released the bottle, and the boy who found it who says that at times he and his friends would search the local shorelines for such treasures. When Tourism Ireland caught wind of the story, they offered a trip to the young women, now twenty, to meet the finder and to visit the town where the bottle washed ashore, Passage East, a small town on the south coast of Ireland. The two parties will meet in the new year. The Cannery is Haunted! We would like to give you a tour! @patrickmgill @VisitRichmondBC Thanks for coming to the Cannery - appreciate the 👍 review!